The last mile in your supply chain management system. The Robocrib® VX500 is a robotic inventory tracking system for cutting tools, fasteners, shop supplies and PPE. The ultimate industrial vending machine! The RoboCrib® series is our most popular industrial vending machine for managing the secure issue and return of items. It accurately dispenses virtually any inventory item you have including very small, large, and delicate items you wouldn’t want to be dropped. It’s good for both fast and slow moving item types. It’s perfect for large numbers of SKUs. Best of all no individual repackaging is needed. The RoboCrib® series can do all of the things a helix coil-style machine can’t. RoboCrib® VX500 stocks up to 628 items. Requires less than 10 square feet of floor space. Using a patented design consisting of a series of counter-rotating carousels all spinning simultaneously, the unit can dispense any item in less than 10 seconds. The wide selection of available bin sizes lets you deliver a wide range of items, including very small, large or delicate items that are not easy to dispense or impossible to dispense from traditional tool vending machines. Every RoboCrib® is customized to fit your items, with door baffles that automatically adjust to fit each bin size perfectly and prohibit access to adjacent bins. When your storage needs change, this also makes it easy to reconfigure because you can easily change out the bins to different sizes. AutoCrib® also offers some great options like field-configurable bins that let you change-out bins with just a single screw. You can host everything on your own secure internal network or use our cloud-based .Net platform online. Whether you are operating in a military-grade network environment or want the ease of an established secure infrastructure you can access online, our software has the flexibility you need. Attaching heavy-duty caster wheels with swiveling action makes your mobile crib easy to maneuver across level surfaces. This is ideal for managing maintenance and repair parts throughout large areas like airline hangars, shipyards, and manufacturing plants. With the frameless doors option, the system can open multiple doors at the same time, allowing larger items to be dispensed vertically. This lets you dispense items impossible to vend in other traditional machines. The ScaleMate® option (with "parts cups") can accurately dispense smaller items such as fasteners while increasing control. The user issues a parts cup from the RoboCrib®, they take the quantity of items needed, weigh the remaining items, and the ScaleMate® tracks the number removed. 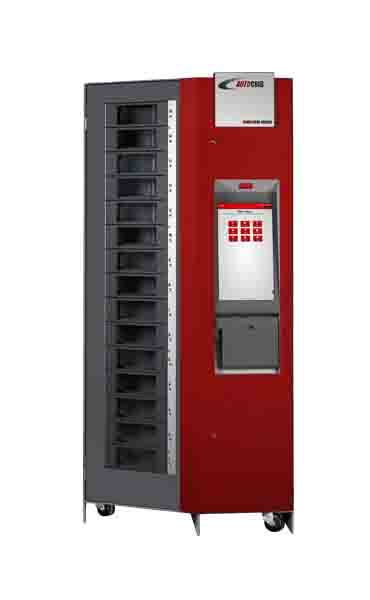 The AutoLocker FX® is a fully automated locker system with a wide-range of sizes and custom configurations. You can attach an AutoLocker FX® to your RoboCrib® and dispense larger items like oversized spares, tool boxes, eTools, calibration gauges, power tools, bandsaw blades, and laptops. Options for built-in power outlets and LAN connections are available.